Stitched Together: And it's finally official, though in our hearts it has been from the start. And it's finally official, though in our hearts it has been from the start. Well we finally got our act together and filed all of our readoption paper work. 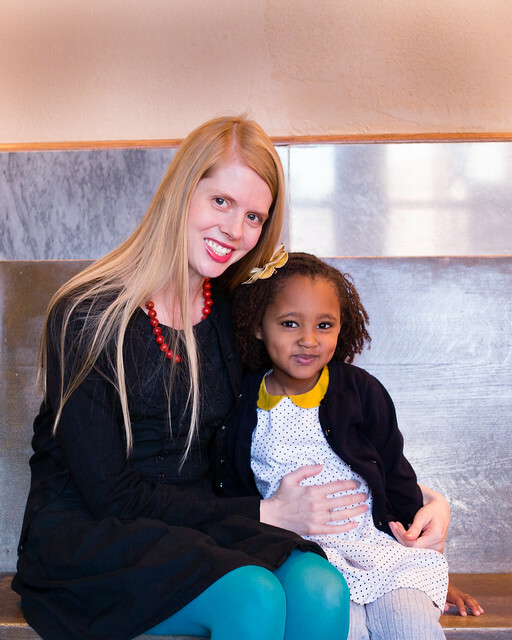 We adopted Tarikua through the court system in Ethiopia, but hadn't re-adopted her in the US. You don't have to, at least not in our state, but doing so does has some advantages, namely having a US birth certificate. 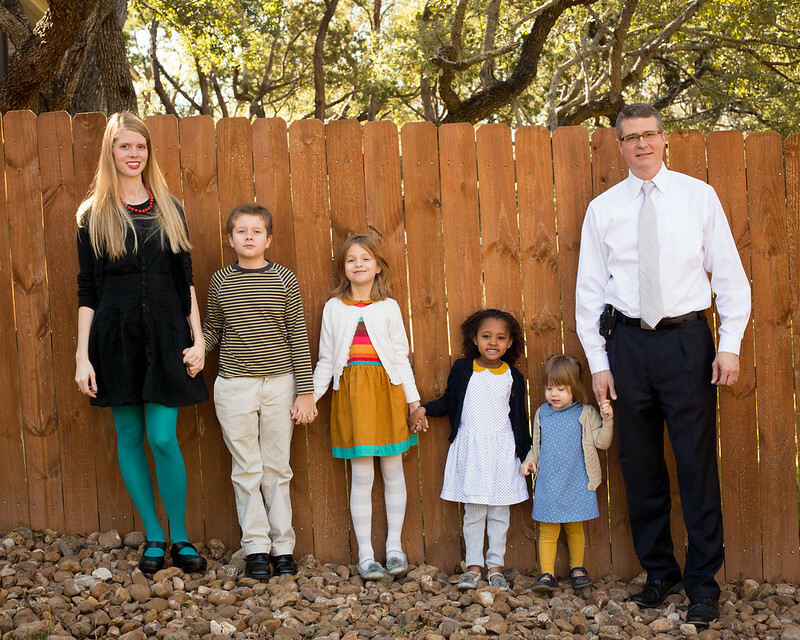 The birth certificate will say she was born in Ethiopia, but is issued by the state of Texas. Having it should make it easier for her to file paperwork when getting a driver's license, a passport, and that kind of thing. Also, we only have one copy of her Ethiopian birth certificate and it would be difficult to get more copies, if that were ever necessary. 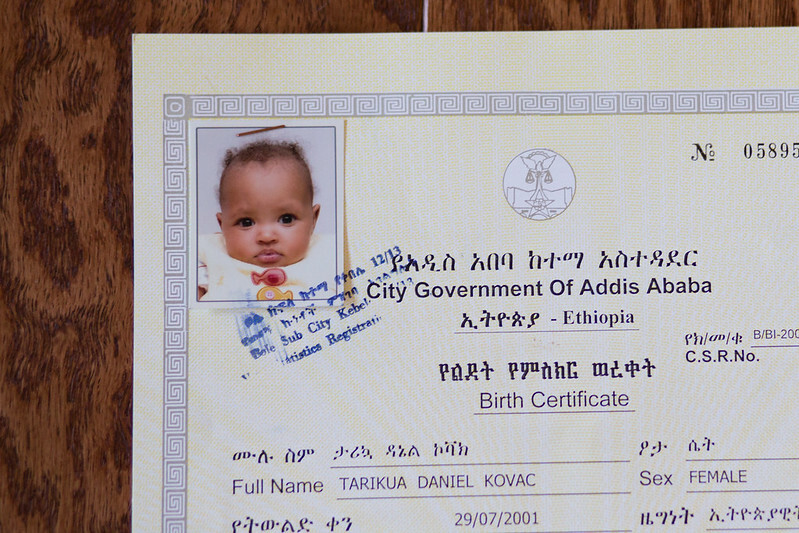 Finally, Tarikua's legal name was Tarikua Daniel, since the Ethiopian courts always assign the child the adoptive father's first name as a middle name. We had it changed to Tarikua Evangeline. Tia's baby photo on her birth certificate. Isn't she the yummiest baby?! It was a special day - for all of us. We all dressed up then headed to the courthouse. We waited outside the judge's chambers to meet with our lawyer before our case appeared before the judge. The lawyer coached the kids on how to raise their right hands (oops, the other right!!) and swear to tell the truth, the whole truth and nothing but the truth. Then we celebrated by having lunch out as a family. It was a milestone we won't forget. We love you, Tarikua! Ah, heartwarming! You guys are all so adorable together. Tarikua just fits right in there. That is fantastic! Very excited for you all. My partner and I are looking at adopting over seas (my partner's country of birth) and then when we are back in Australia I will have to legally become a parent too. Thank you for sharing your journey, it is really reassuring for me. Aw, congratulations. 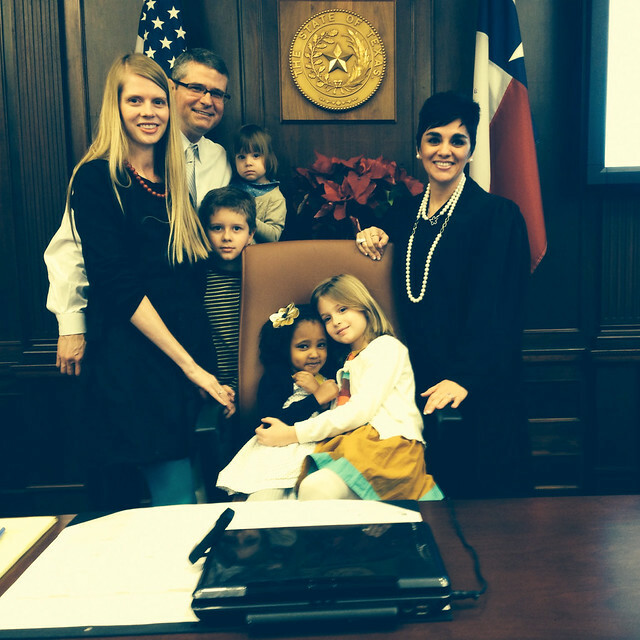 International adoption is really a roller coaster - at least it was for us. So many highs and lows, and so many unknowns. But so worth it. I wish you all the best on your journey to your child! Congratulations! That is a milestone. And I love the family photo with the girls all in their handmade dresses - gorgeous. Congratulations! What a great day! I love your family shots of such a wonderful occasion...almost everyone wearing mama-made! It's such a big deal to go that extra step and then celebrate together. How lovely! Speaking of mama-made...what pattern did you use to make Tarikua's dress? I'm a sucker for a peter pan collar! Congrats! That's very exciting for your family! Congratulations! Your family looks beautiful on all those photos. I hope you had a great celebration! Congratulations! What a beautiful family! Aw, so beautiful! Congratulations! You have such a beautiful family. I love the photo with the judge - I'm sure that moment made HER day too. :-) The handmade dresses add a little something extra special. So enjoyed reading this. We are waiting to be matched and there are days when you just feel defeated; as though it will never, ever, happen. Reading this gives hope. Congratulations to all of you! Aw, I'm so glad that it encouraged you. The waiting is hard. 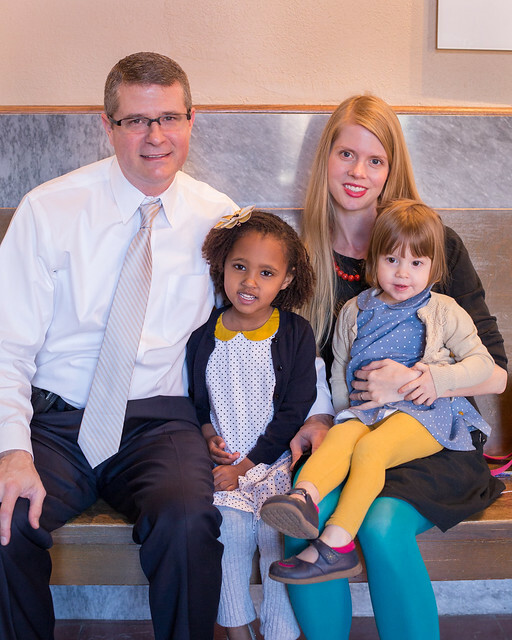 We didn't wait long for a referral, because when we adopted Tarikua, Ethiopian adoptions were moving quickly. But the wait to travel to bring her home was excruciating, even though, again, it wasn't too long (4 months). I know, I can't complain about our wait! But I can attest to the fact that it was still so difficult. I just can't get over that baby picture! What a cutie pie! And congrats to your family on such a special day. You sure are one good looking family! YAY!!!!!!!!!!!!!!!!!!! Imagine a squeal with me waving my arms like Wallace (from Wallace and Gromit) when he's talking about a good cheese. :) So excited for you all and for Tarikua! She absolutely glows in those pics. And you know I have a special place in my heart for that court house. :) I know there's still some paperwork to do, but when she gets her CoC, it will list your readoption date as her citizenship date, so congrats, Tia! Wow, Jenny, I didn't know that! How interesting! It was such an exciting day and a little emotional, too. I definitely wiped away a tear or two. 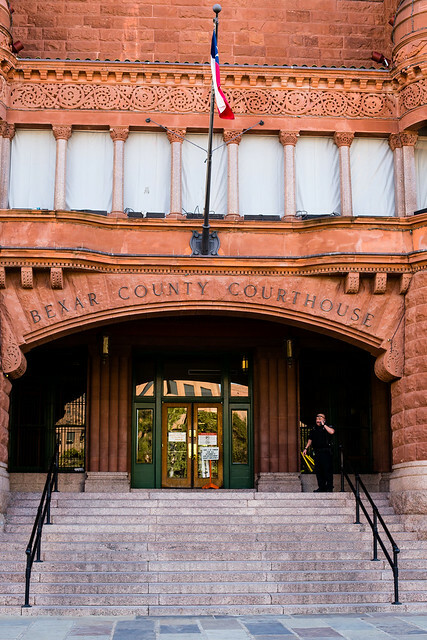 :) Why do people come to Bexar country to do their re-adoptions? We were with another adoptive parent who was coming from Austin. We were curious about that. Jenny, thanks for the explanation. That's so informative. I had no idea other counties made it so much more complicated. Adoptive families already have so many hoops to jump through (and like you said, the rigorous process is good) plus we incur so many expenses. I'm glad this part of the process was streamlined and more affordable. Part of the reason we waited for so long to do our readoption was because the quotes we received from attorneys were around $2500+. Thankfully, you referred us to the attorney we used and she was great and affordable, too. So thank you! Heartfelt congratulations!! What a special day for you, and low-res pictures are sufficient for capturing such a momentous occasion! I remember our own daughter's adoption court date as well . . . as well as the opportunity to sit in the chair:) That birth certificate photo of Tarikua is crazy cute - much like she still is today:) So happy for the whole family! The photo with the judge is the quintessential readoption photo, isn't it? A milestone moment! So wonderful and heartwarming! The abundant love and patience and everything good knocked my socks off while reading this. Congrats, congrats! !